An international team led by a researcher from Hiroshima University has succeeded in revealing the detailed structure of a massive ionized gas outflow streaming from the starburst galaxy NGC 6240 (Figure 1). The team used the Suprime-Cam mounted on the 8.2-meter Subaru Telescope on Maunakea in Hawaii. The ionized gas the astronomers observed extends across 300,000 light-years and is carried out of the galaxy by a powerful superwind. That wind is driven by intense star-forming activity at the galactic center. The light-collecting power and high spatial resolution of Subaru Telescope made it possible to study, for the first time, the complex structure of one of the largest known superwinds being driven by starbirth – and star death. 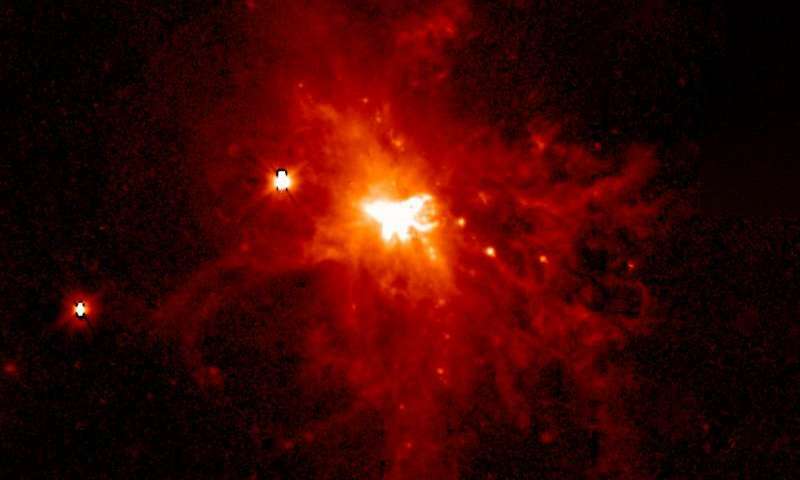 The term "starburst" indicates large-scale intensive star-forming activity, making a "starburst galaxy" one where starbirth is occurring on a grand scale. The star formation rate (SFR) of our Milky Way Galaxy is approximately one solar mass per year. By contrast, the SFRs of starburst galaxies reach ten, or even a hundred to a thousand solar masses per year. Starburst activity is a very important part of galaxy evolution. When a starburst occurs, the intense episode star formation rapidly consumes the galaxy's interstellar gas. In addition, ultraviolet light from newborn massive stars as well as gas heating and ram pressure from supernova explosions blows much of a galaxy's gas away into intergalactic space. This galactic-scale energetic wind is called a "galactic wind" or "superwind". Its action forces interstellar gas out of the galaxy very efficiently, which accelerates the galaxy's gas-loss rate. It also chokes off star formation. The metal-rich gas expelled from the galaxy's disk pollutes its halo as well as intergalactic space. Consequently, starburst and starburst-driven superwind significantly affect the evolution of the galaxy and the gas outside of that galaxy. One of the mechanisms that seems to induce large-scale starburst activity is galaxy collision and merger. When two gas-rich giant spiral galaxies merge, the gravitational perturbation induced by the merging process disturbs the orbits of stars. At the same time, the gas in the galaxy disks loses its angular momentum via viscous process associated with gas mixture, and falls into the gravitational center of the merger. This creates a vast concentration of gas, which begins to coalesce, creating a starburst knot. The starburst also creates a huge amount of dust which emits strong infrared radiation as it absorbs ultraviolet light from the newly born massive stars. NGC 6240 is a starburst galaxy fairly close to the Milky Way, at a distance of about 350 million light-years. Its SFR is estimated to be 25-80 times that of our galaxy (Note). It has a peculiar, disturbed morphology (Figure 1) which indicates that two spiral galaxies are merging. Due to the giant starburst at its heart as a result of the merger, NGC 6240 is very bright in infrared light being emitted from heated dust. The total infrared luminosity reaches almost a trillion times of that the Sun's. NGC 6240 is an important object to investigate in order to understand the physical and evolutional relationship among the processes of galaxy merger, the action of a starburst, and the phenomenon of an active galactic nucleus. Hence, it is one of the most-studied starburst galaxies in the nearby universe within 500 million light-years of the Sun. The research team wanted a wide-field of NGC 6240. The Suprime-Cam optical camera was used on Subaru Telescope to zero in on the detailed structure of the starburst-driven superwind. In addition, the team searched for important clues to understanding the starburst history of NGC 6240. 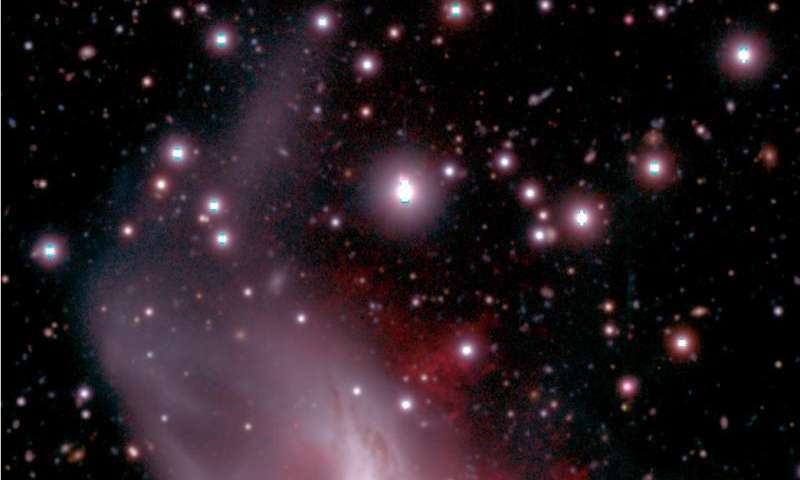 They observed the galaxy using a special band-pass filter that selectively transmits the light around an emission line produced by ionized hydrogen (called the H-alpha emission line). It allowed them to study the structure of the ionized gas associated with the superwind. Their unprecedented deep observation (long-exposure images) revealed a complex giant ionized gas nebula (called an "H-alpha nebula") surrounding NGC 6240 (Figure 2, 3a). This nebula extends out about 300,000 light-years and contains complicated structures of filaments, loops, and blobs (Figure 3b). 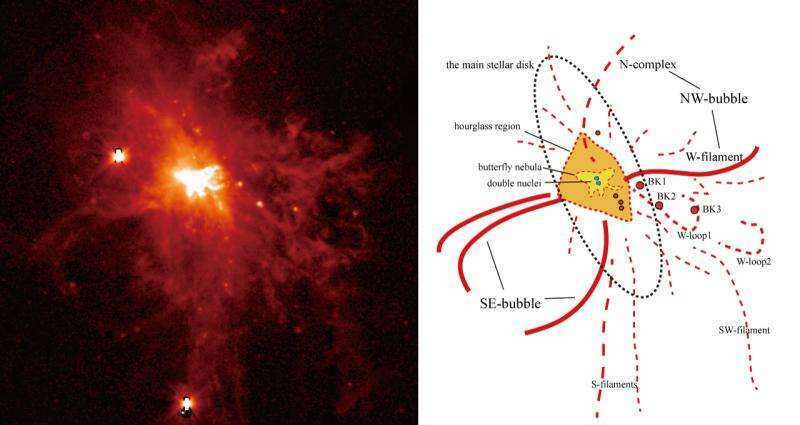 Astronomers knew that such a large ionized gas nebula surrounds NGC 6240, but the depth of the observation significantly surpassed any previous studies and first allowed the Hiroshima team to study the some of the faintest, most detailed structure of the nebula. Large "broken bubbles" were detected in the northwestern (upper right direction of Figure 3b) and southeastern (lower left direction of Figure 3b) parts of the galaxy. These features are the evidence of a past energetic bipolar-shaped superwind that blew along the minor axis of the main galaxy disk (orthogonal to the main galactic disk). The research team performed detailed data analysis and found that NGC 6240 has experienced violent starbursts at least three times in the past and each starburst drove an energetic superwind. Those superwinds form complex structure in the H-alpha nebula. The oldest starburst started about 80 million years ago. Astronomers think that the galaxy merger process of NGC 6240 began about a billion years ago, so this work suggests that the later stages of the merger are what excited the gigantic starbursts and subsequent superwinds. These results contribute new information to the studies of galaxy evolution and its relation to galaxy-galaxy mergers. These features are the evidence of a past energetic bipolar-shaped superwind that blew along the minor axis of the main galaxy disk (orthogonal to the main galactic disk). So why did the merger maniacs fail to emphasize aka Fermi Bubbles, etc.? ...experienced violent starbursts at least three times .. and each starburst drove an energetic superwind. ... The oldest starburst started about 80 million years ago. Astronomers think ... later stages of the merger are what excited the gigantic starbursts and subsequent super winds. One core spawned the other core, and both have grown rapidly in the denser region of the central core, like in so many other examples. A recent comment by LaViolette on the core fissioning process that we are likely witnessing in this story as well.